The Inter-American Dialogue recently launched an updated version of its China-Latin America Finance Database, a source for online, up-to-date information on Chinese finance in Latin America and the Caribbean developed in collaboration with the Global Economic Governance Initiative at Boston University. Chinese finance surged last year from less than 5 billion in 2012 to $20.1 billion in 2013, making it one of the highest years on record. Chinese finance to Latin American and the Caribbean peaked at $37 billion in 2010 — more than World Bank, Inter-American Development Bank, and U.S. Export-Import Bank finance combined that year. Chinese banks finance a different set of countries than the World Bank, Inter-American Development Bank and North American and European banks. Argentina, Ecuador and Venezuela, which are not able to borrow as easily in capital markets, have been a focus of Chinese lending in Latin America. Chinese banks tend to focus on natural resource-based and infrastructure sectors. From 2005 to the present, Chinese policy banks financed $54.4 billion in infrastructure projects. Energy projects accounted for $26.3 billion of overall Chinese finance the region. 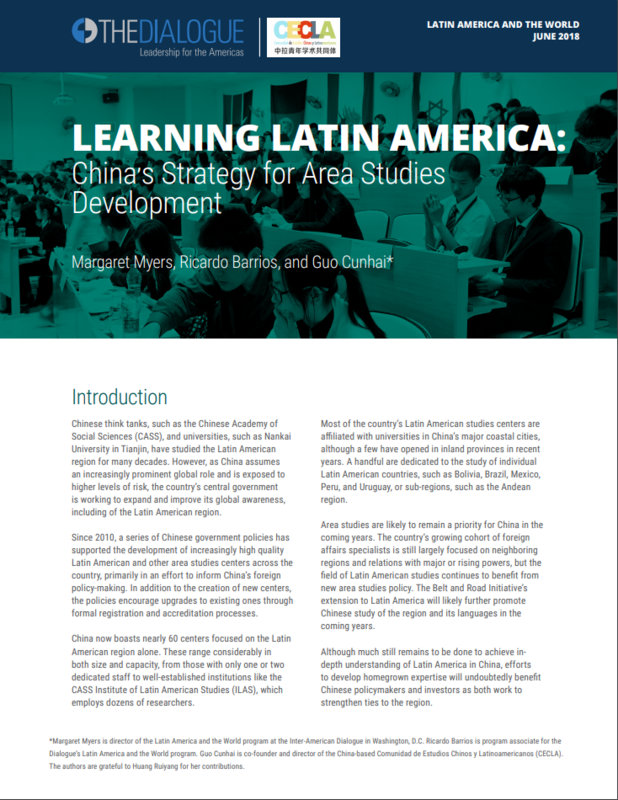 Roughly half of Chinese financing to Latin America comes in the form of commodity-backed loans, arrangements where finance is repaid in specified quantities of primary goods over a given period of time. Unlike Chinese lending in Africa, where Chinese lending has been reciprocated by exports of diverse commodities including coffee and diamonds, resource-backed loans to Latin America are exclusively tied to oil shipments. The prospect of structural economic reforms in China have raised concern about a serious slow-down of Chinese economic growth and outward investment. However, China’s continued focus on urbanization and its limitations in terms of domestic grain production will continue to drive demand for Latin American commodities in the foreseeable future, making the region a valuable partner for China.